A few days ago I made my very first pie, and while it didn't turn out *perfect looking* it was definitely tasty. I picked a simple apple recipe and cheated with premade crusts (which, let's be honest, is probably what I'll stick to because making a crust from scratch scares me). Yesterday I made another apple and a pumpkin, and I have a coconut recipe picked out. I definitely want to make a hundred more pies now, and I have all these flavor ideas floating around in my head (it doesn't hurt that this is one of my favorite movies ever...). Do you have any favorite pies to make? Or any tips and tricks for a total noob like me?? I'd love to hear them!! So cute, right?? I haven't seen it in my local target but they have it online! The skirt is so, so cute! That skirt is the inspiration for this group!! I love it so much! Isn't it the best?! Swoon. That second sweater is absolutely amazing! I love it! There is a little mountain town about 45min from downtown San Diego called Julian. I LIVE for the fall when they make their Apple Pumpkin Pie. It is like crack. Julian is known for their apples. So this pie makes you want eat the whole thing, by yourself, in one sitting. Seriously, they need to make gum in that flavor. Ahh that sounds amazing!! I wish I knew their secrets!! I'm jealous, I'm dying over that skirt! I have never actually liked ANY pie (I know! How unamerican of me!) but I do love that sweater from target and the sparkly flats! Too cozy and cute! 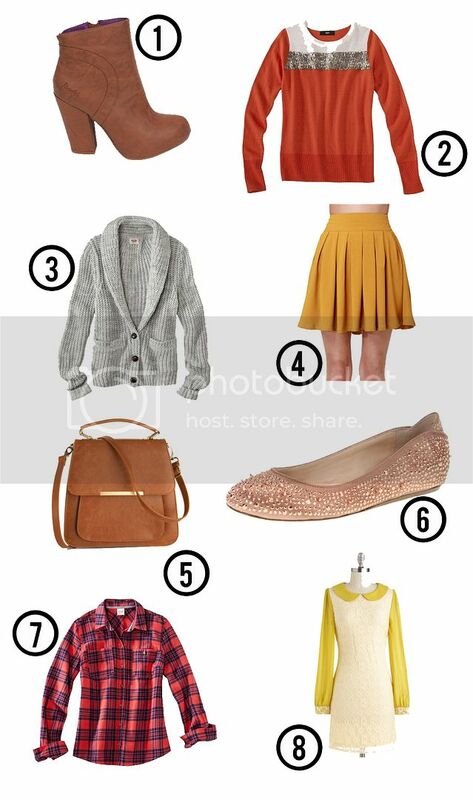 That mustard yellow skirt is just the cutest I love it!! I hate the fact I'm on a spending ban, seeing all these pretty clothes has made me want to go shopping for new winter clothes! If pie is the same as tart, my nan passed on her recipe for the most amazing apple and blackberry tart. I'm too afraid of messing them up to make one, so I make do with crumbles. Just as tasty! Oh my goodness. x.x Those boots, that sweater and that plaid shirt are all so drool-worthy! I wish I could help you with pie-making advice... but I cannot cook/bake! Eep! #5 looks just like the sweater from Target I put on my Christmas list! I love everything so much.